Been here since Morrowind, but missed out on Oblivion. Came back for Skyrim, stuck around for Daggerfall. Annoyed the Patrollers so much, they made me one. I was away from home for a few weeks, and no longer had access to my copy of Skyrim. 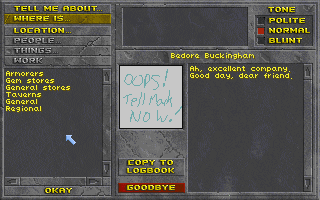 Being extremely bored and needing a fix, I downloaded Daggerfall one night. The next day, I went out and bought a used copy of Oblivion. Given these two choices, Daggerfall won out. I'll admit, I didn't see that coming. 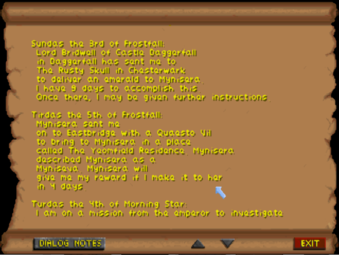 So, I'd like to share the story of my very first Daggerfall character. Prologue: Emperor Uriel Septim VII himself personally summoned me to the Imperial City. We met secretly at midnight (along with Ocato, beause someone had to hold the torch). The Emperor decided to trust me with a super secret mission just because I'd saved his son's life some years earlier or something. 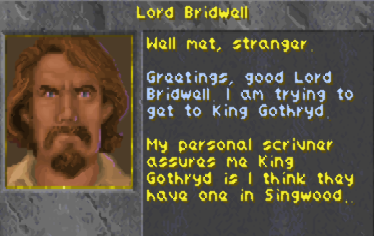 His friend and Imperial loyalist, King Lysandus of Daggerfall, is dead. And now his ghost is haunting the city and screaming about VENGEAAAAANCE and nobody knows why. Uriel (we're certainly on a first-name basis) tasked me with putting his good friend's spirit to rest as a personal favor. Also something about finding some missing mail, because even in Tamriel you can't trust couriers to absolutely, positively get it there overnight. Gameplay: I went into the next room and got bitten to death by a rat. My second character did much better. This user is normally a Breton. This user has been on UESPWiki for 7 years, 3 months, and 10 days. This user has made a grand total of 5,660 edits in 2657 days. This user is the coolest patroller ever for using "defenestration" on an article. HE'S LITERALLY RIGHT NEXT TO YOU! Jerk. 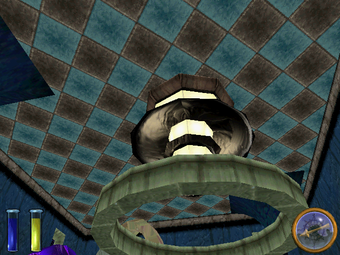 A ceiling in Battlespire, or a floor in Daggerfall? This page was last modified on 27 September 2018, at 23:10.